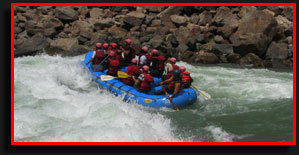 This is a rafting expedition on Sharda river (also called Kali Sharda), which forms a natural border between India and Nepal. The trip is largely disconnected from roads and civilization, as the river enters a wide gorge from Pancheshwar, and flows through the Terai jungles. Camp sites are heavenly on isolated remote beaches. The region is rich in flora and fauna, and one can easily sight a wide variety of rare birds and wildlife. Throughout the trip, we would have India on our right side, and Nepal on our left. The river trip starts from Pancheshwar, and finishes at Tanakpur. This is a high volume river with mostly up to class III kind of rapids and one class IV rapid. In all we would be rafting on 04 days, and 01 day would be for transit. This is an exotic self supported rafting experience which has all the elements of remote wilderness, beautiful untouched beaches and action packed whitewater. Day Early morning arrival to Kathgodam. Transfer by road to Lohaghat (6 hours ). Lohaghat is a small hillstation besdes the Lohawati river, at an altitude of 1770 Mtrs. Overnight stay will be guest house / camp. 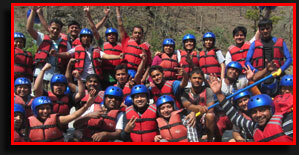 Our river trip starts from Pancheshwar, which is about 40 kms from Lohaghat. At Pancheshwar, the river Saryu confluences with the Kali river, and hence forth it iscalled Sharda. Pancheshwar is famous for sport fishing of Mahaseer. After a detailed briefing we start from Pancheshwar on rafts in self supported manner with all our camping gear and luggage packed in waterproof drybags, secured on a cargo raft. The river would be pacy, and participants can look forward to several exciting rapids before we camp on a beach besides the river. Expect loads of thrills today as we move from Pancheshwar towards Sonali Gaon and encounter grade 3 rapids as the river picks up volume. The untouched beauty around is breath taking and has us all wishing for the day not to end. Overnight at camp. 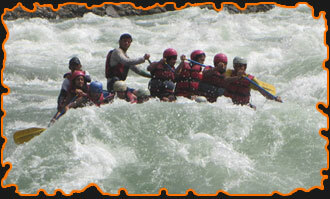 The river run from Sonali Gaon to Pari Gaon takes us through Kali’s biggest rapid, the ‘Chuka’, a grade 4+ rapid. As the rapid has several channels we will scout around before running it. A few more grade 3 rapids before we reach camp across the river from Pari Gaon. There will be plenty to discuss and remember about the day when we sit around the camp fire tucking into a hot, delicious meal. Overnight at camp. The last day on the river we start from Pari Gaon to reach the take out at Boom. There is a distinct shift in the vegetation around as we enter the Terai region and you may find wild elephants sharing the river with you! After lunch load up and drive to Kathgodam . overnight at Hotel. Day Early morning arrival to Rishikesh.